Well, hello there, and welcome! It’s nice and cool here in Kentucky, and the leaves are starting to turn. Football games are in full swing, and pumpkins are primed for pickin’. There are Fall festivals going on, and the apple orchards are stocked with fresh apple cider…it’s my favorite time of the year! Grab a quilt, get comfy, and enjoy my Fall Home Tour! Just in case this is your first time here, let me give you a little bit of info…my home is smallish, and we live here. With two kiddos, a husband, a huge horse of a dog, and a teeny little kitty, our home is very well loved, and quite broken in. We have a revolving front door and love hosting parties. 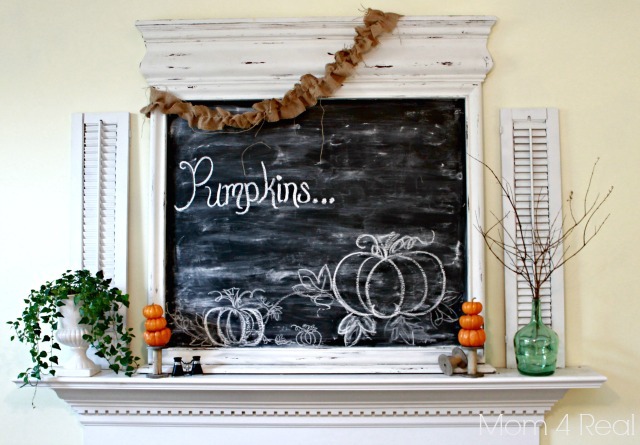 As you will see, I have a vast love for all things aqua and white, and absolutely love chalkboards. 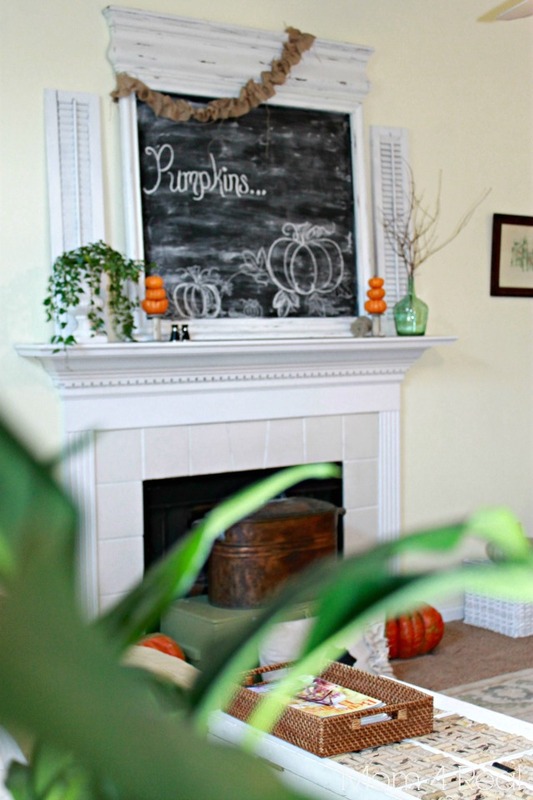 The one above the mantel is my favorite…I made it using an old mirror last year right before Christmas! 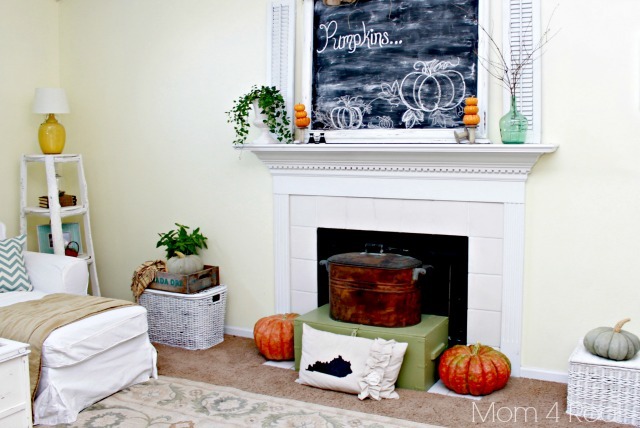 I love tucking pumpkins everywhere I possibly can in the Fall. You’ll find them on virtually every surface! This year I have also fallen in love with orange…it’s the perfect compliment to all of the aqua and white I think. 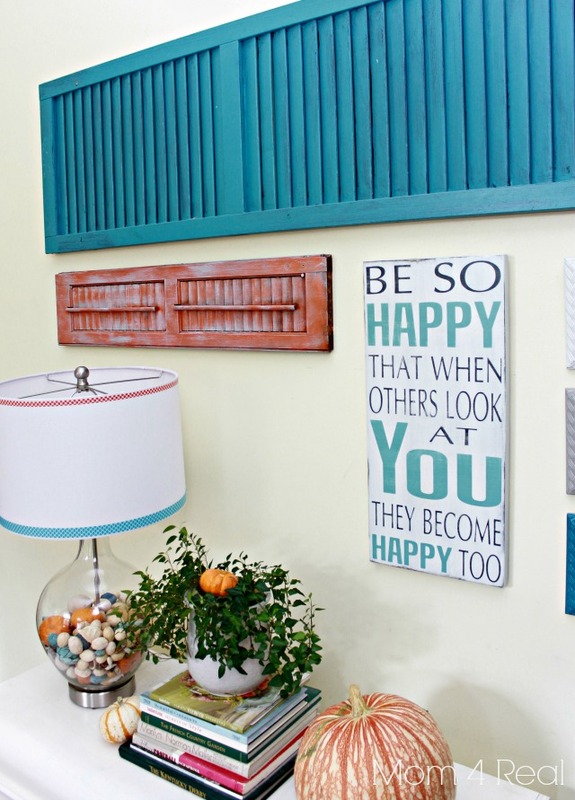 I recently painted an orange shutter to add to my gallery wall, and just love it! 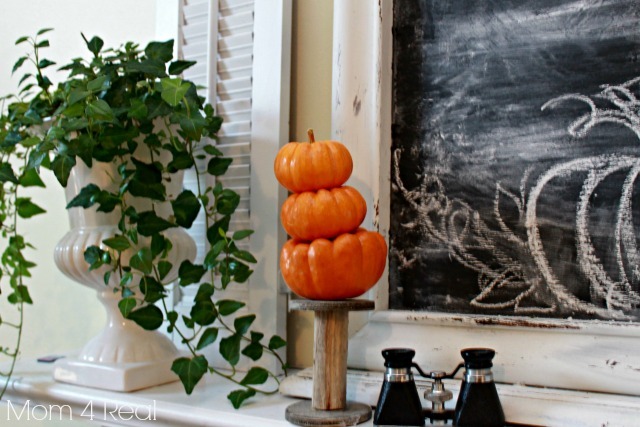 I added some sweet little mini pumpkin topiaries to my mantel…aren’t they the sweetest? Now, onto my dining room. I like to keep it pretty simple on the table since it’s the busiest space in our home. 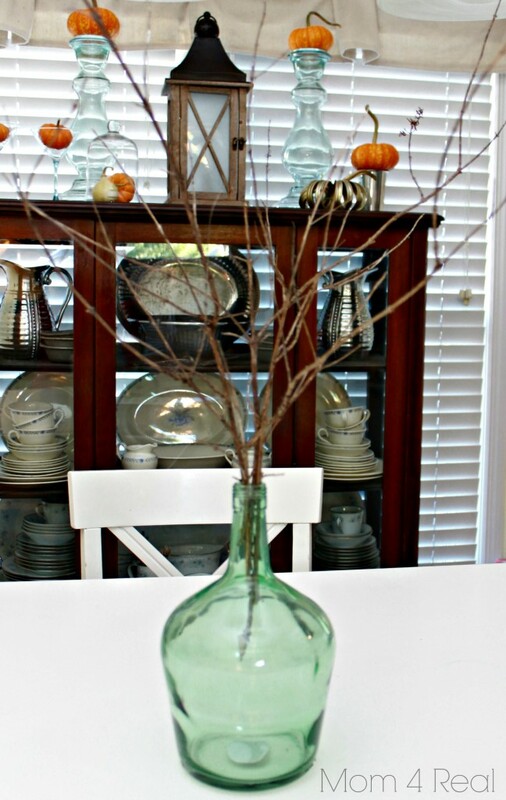 I could put together a beautiful tablescape for ya, but I really want to keep it real, so I just placed a vase with some branches in the center of the table this year instead. Since I don’t decorate the table so much, I like to add some pumpkiny goodness to the top of my hutch instead…did I mention how much I love little pumpkins? I just love the feel in here…not too overdone, just right, I think. Now, onto the kitchen! I took out some of the lime green items, and added some pops of orange. I spray painted a ceramic bird, added some of my Grandma’s dishes, and more mini pumpkins to add a little bit of Fall in here. This is my favorite pumpkin so far this year…I mean mix pumpkins and aqua together, and what do you get? One happy Jessica! I just love the way it all came together…whose ready for pumpkin pie? This is my favorite spot in the whole house…my breakfast nook. It’s forever changing to suit the needs of our family, but I think it will be staying like this for quite a while. It’s my favorite place to work, think, eat, and just hang. I love the way the light shines in this little area, and the cozy feeling I get when I’m having my coffee here in the morning and working on my posts! And since I love candlesticks, but don’t really love candles (weird, I know! ), I like to add little pumpkins to the top of them instead. This year I found these pumpkins with perfect twisty stems. Aren’t they to die for? While my breakfast nook is my favorite place inside my home, my patio is my favorite place on the planet! It is perfectly anchored by a Bradford Pear tree that was teeny tiny when we moved in. It has grown with our family, and gives us the perfect space for s’mores making and hanging with friends and family. And now that it’s getting cool here in KY, it’s the perfect time for a fire! Time to turn our little lights on, light the fire, and enjoy the evening. Thank you so much for stopping by our little home…I hope you will come back and visit often! 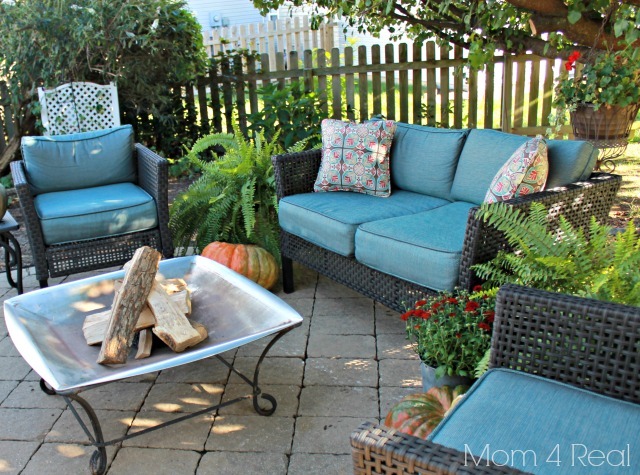 Beautiful Fall in your home, Jessica and outdoors too! Super Fall home tour! The mix of aqua and orange is so pretty. It makes me happy! Ahh….so sweet!! I love your patio too! That pear tree is so charming! P.S. pinecones go on the top of candle holders…silly girl! Your home is so bright and cheerful. Love the orange and aqua together for fall. 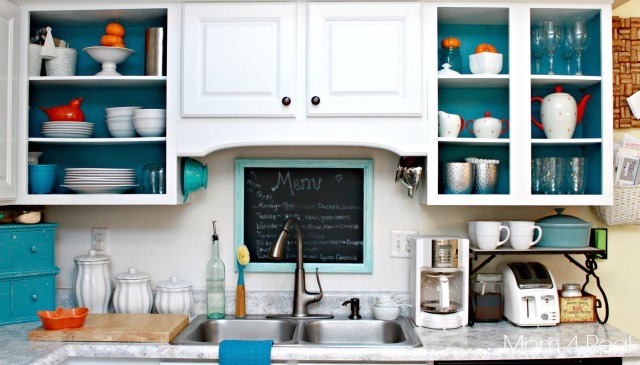 You’re making me want to pull the doors off my cabinets and paint the inside a bright cheerful color! Great job on the tour! Your favorite turquoise looks great with the orange of the season! Thanks for sharing! So cute Jess! The outdoor shots are my favorite :) Love the s’more bar!!! 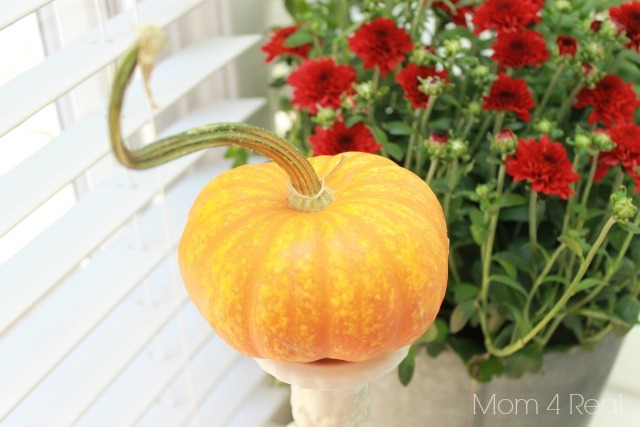 I LOVED seeing the pictures of all your beautiful fall decor! Thanks you so much for sharing them. It was a lot of fun and inspiring. I’m ready to decorate! What a sweet house you have Jessica. I love that you said your home was “well loved and quite broken in”. That’s just what a home should be. I think your home looks HAPPY! The aqua, white and orange are a fabulous combo. 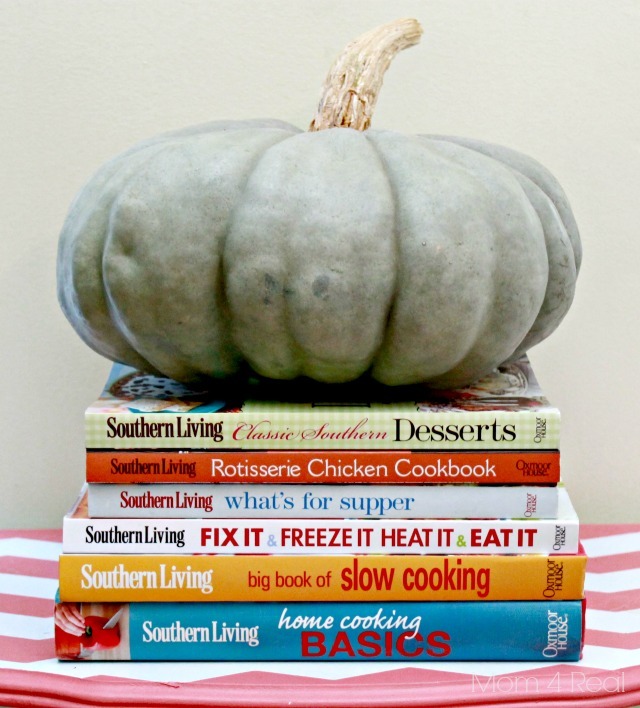 You cinderella pumpkin looks so at home sitting on top of you Southern Living cookbook collection! Thanks for letting us visit your home filled with aqua, white, pumpkins and love! Blessings to you today! Your patio is so inviting Jessica. Great tour! Pretty Pretty!! I am grabbing my beer and hitting that fire with you! Jessica, everything looks smashing! I love the way you’ve added pumpkins here, there, and everywhere. I’m crushing on aqua and orange this fall, too, although you DEFINITELY have me beat in the aqua department. But honestly, doesn’t it work so well alongside the traditional fall colors? 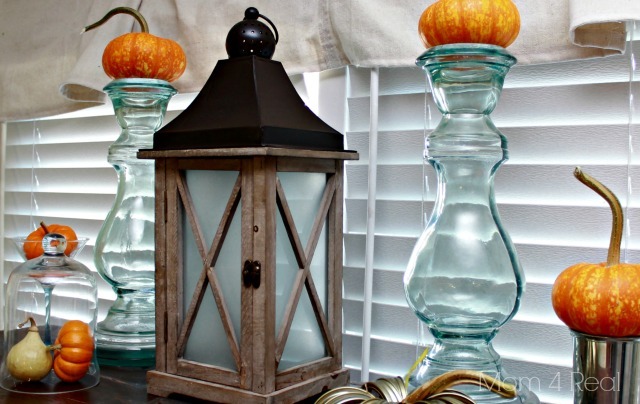 Your fall decor looks lovely! I enjoyed your tour! Have a great day! Jessica–this is so cozy! I love aqua, too—couldn’t use it in our last house, but have touches of it here in the cottage. Twisty stems?? Be still, my heart! your house is darling, you have so many wonderful touches! 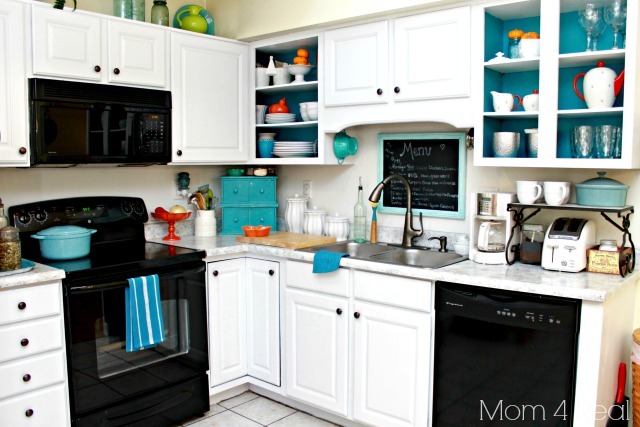 Jessica, I love the touches of orange in your gorgeous aqua kitchen! And I would be in heaven sitting in your outdoor space by the fire. We keep intending to make a fire pit and hopefully this fall will be the time we do it! Loved every bit of your tour! Jessica your home is lovely! Your a girl after my own heart with all of the turquoise! So in love with you kitchen! Wonderful tour, Jessica! I’m loving orange and fall colors mixed with turquoise and aqua too. You’ve done a perfect job of adding just enough and not too much. Love all of your autumnal touches. LOVE your comment about candle holders vs candles. I am the same way!! Love your tour. Hi Jess. Love your home! 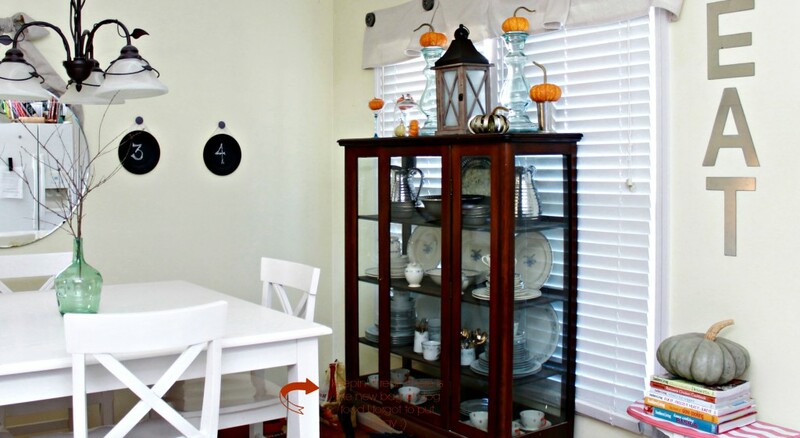 Especially the chalkboard and all of those glass candle/pumpkin holders you have. How perfect for fall :-) I hope you get to enjoy that fire! You did a beautiful job, I LOVE your mantle! Jessica, it’s beautiful. I love the touches of beauty mixed with a family living a real life! Great job! Love ‘ya! 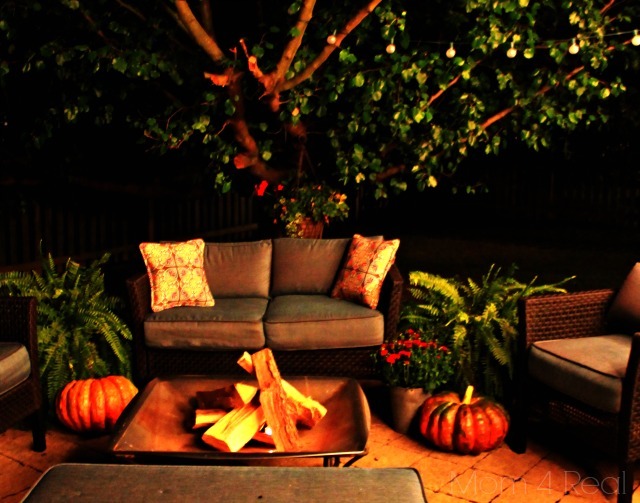 Can I come and sit by the fire pit – I’ll bring wine! Beautiful home tour Jessica!! I love how you mixed aqua white and orange to create your cozy welcoming home! 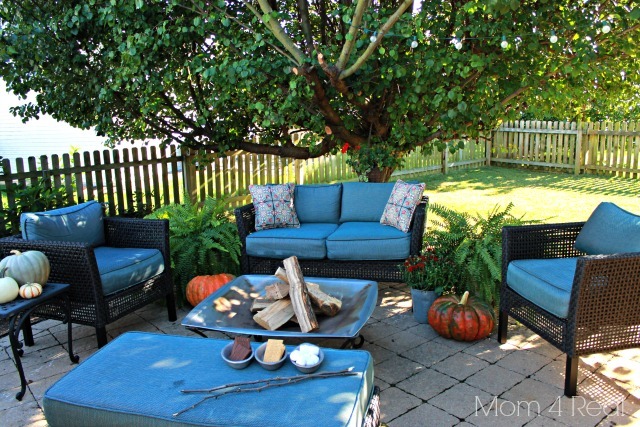 I love your outdoor seating area – I’d love to pop by and sit and dish with you for a while sipping on an apple cider! Pinning! 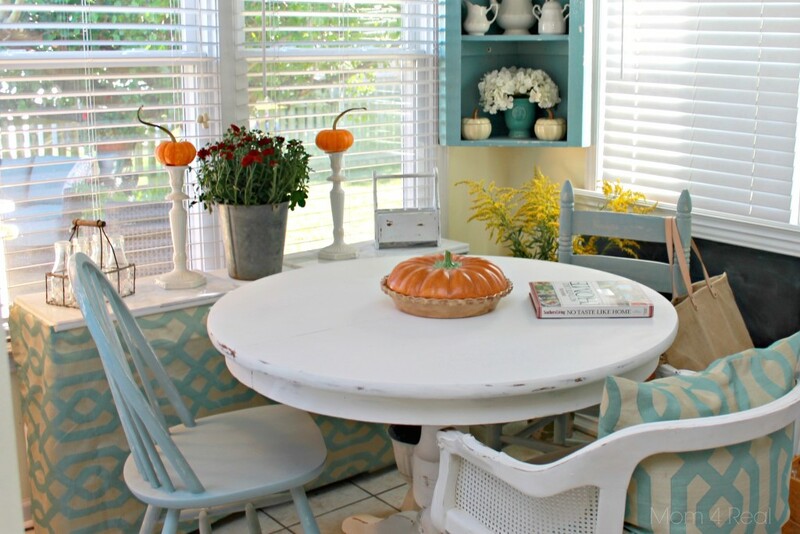 Your home looks so lovely done up for fall Jessica- all the blue with the orange! I love that colour combo right now and used it a lot in our house too – who says that blue isn’t a fall colour! Think of the clear blue sky on that perfect crisp autumn afternoon (unfortunately ours have been full of gray rain clouds so far this fall… but there is still hope! ).